Deddy Mizwar born in Jakarta, March 5, 1955 is a senior actor and director in Indonesia. Betawi actor's love of the art world is not indisputable. Proof. after school. he had the status of civil servants in Jakarta Health Agency. But the father of two children only like 2 years as an employee because he was infatuated play theater-he joined the Young Theatre Jakarta. More. he devote much of his life to the art world. rather the role art. Art blood apparently gushing from his mother. Ny. Sunah who had led frightening Betawi arts. Eventually, she and her mother often hold art events in the surrounding villages. "First time gig, when the show's August 17 at home. I am very proud of that time. Because ditepukin the whole village. I was so addicted to acting" recalls Deddy. Her love of the theater has changed his life. Growing up. about 1973. Deddy began aktifdi Jakarta Theatre for Young People. And through this theater acting talent honed Deddy start. Deddy was nominated as Best Actor at the Festival Theatre for Young People Tainan Ismail Marzuki. Do not just rely on natural talent. Deddy later attended LPKJ. but only two years. Started career in films in 1976. Deddy work hard and devote his acting skills. in a variety of films starring. The first time you play the movie, in Enduring Love (1976), directed by Rev. Sihombing. professor at LPKJ. she got the lead role. Peak. her role in Naga Bonar increasingly held it in popularity. Acting his talents to fruition by winning four images at once in FF11986 Cup and 1987 include: FFI Best Actor in Hanggara Arie (1986). Best Supporting Actor Opera FFI in Jakarta (1986). FFI Best Actor in Naga Bonar (1987). and Best Supporting Actor I gave FFI in Everything (1987). In the early 90's. Deddy Mizwar career peaked. Through the strength of his acting is awesome. popularity was in his hand. Although the name is more popular. Deddy feel empty. In the midst of solitude. thoughts took him back to his childhood. Born in Jakarta, March 5, 1955. He grew up in the Betawi ethnic religious nuances. He remembered the atmosphere in the mosque preaching calm and cool. His soul wanted to taste the atmosphere of calm back in childhood. Inner turmoil finally ends when he believes that life is simply to worship God. Since then. Deddy intense religious study. Now everything should be worth Deddy worship. Included in the field that they do the world of film and soap opera. soap operas and religious themed movies as a form of worship of God kep3da. For Gisela erected PT Citra Cinema 1996. His commitment was made in spite of the subsequent development of many hurdles and obstacles encountered. When that Islamic religious soap opera is still a rare commodity and less acceptable to the television station. These conditions did not dampen the pace. So they invented the soap opera that aired Nomad Tale of Ramadan. His efforts to fruition. Rating soap opera is quite encouraging. After that hampirsemua religious television station broadcast soap operas during Ramadan. Berjuangnya really hard but after that everyone can enjoy. " Deddy said proudly. He admitted that having religious soap products Islam is difficult to get a place in television than in the month of Ramadan. This is due to under-estimate TV station too beside many filmmakers are not willing to membuattayangan religious patron outside the month of Ramadan. In view Deddy Mizwar. the film is one of the most effective propaganda media to convey the message of Islam to the wider community, including non-Muslims. "I demonstrated the soap opera 'The hallway Time' which was interested also by non-Muslims. Even. current 'Lorong Time' played back outside of the month of Ramadan to me concluded soap opera or movie propaganda should not synonymous with Ramadan. ' he said. In other words, the public seems willing to accept and welcome the religious hangattayangan outside Ramadan. Forward. 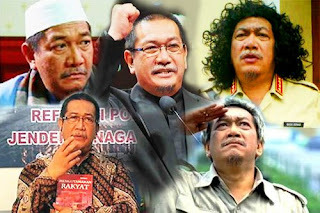 Deddy will continue to consistently produce religious films and soap operas. He also suggested that Muslims establish their own TV station. thus Muslims have alternatives in selecting a TV station or show. "It's about time Muslims filling and coloring TV shows. 3rah I see the potential for it is quite large especially among young filmmakers and students. Said the actor who has starred in around 70 films is full of optimism.